It’s been seven months since two devastating earthquakes killed at least 8,790 people and destroyed 498,852 houses across Nepal. 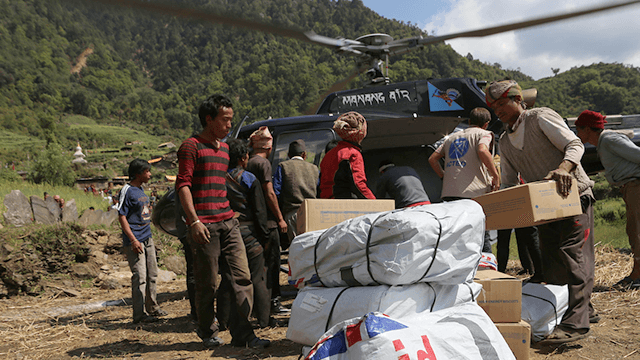 The international humanitarian community together with the Nepalese government immediately launched relief activities to meet the needs of those affected. The International Organization for Migration (IOM) is one of the agencies that support emergency operations in several areas of concern – Camp Coordination and Emergency Shelter Support just to mention two of them. I am a student of the Geography of Environmental Risks and Human Security Master’s degree program at the United Nations University-Institute of Environment and Human Security in Bonn. I did an internship with UNOCHA in Geneva when the earthquake struck Nepal and was appointed focal point for OCHA’s Virtual On-site Operations Coordination Centre (VO). 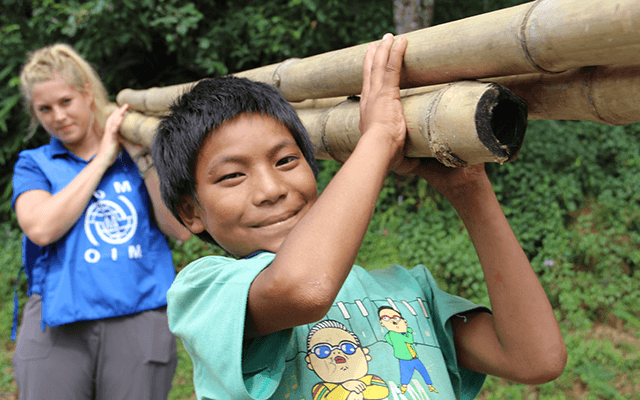 After this experience, I moved to Nepal to support the operations of IOM’s Shelter Pipeline as their Information Manager. Shelter Pipeline is a relief mechanism that is in charge of the receipt, transport and delivery of relief items to the affected population. IOM purchases shelter materials, such as plastics sheets, ropes, corrugated galvanized iron sheets (CGIs), bamboo, and blankets, among other necessary items for distribution. Nepal’s geography, with high altitudes and very remote and inaccessible areas, challenges the delivery of humanitarian assistance. Relief material for affected population in these areas has to be air lifted by helicopter. Helicopters can only carry a limited amount of volume and weight and are highly dependent on good weather conditions. During the monsoon season – from July till September – many flights were cancelled creating a delay in urgently needed assistance. Photo by IOM Nepal. IOM follows a process to set up the distribution site. 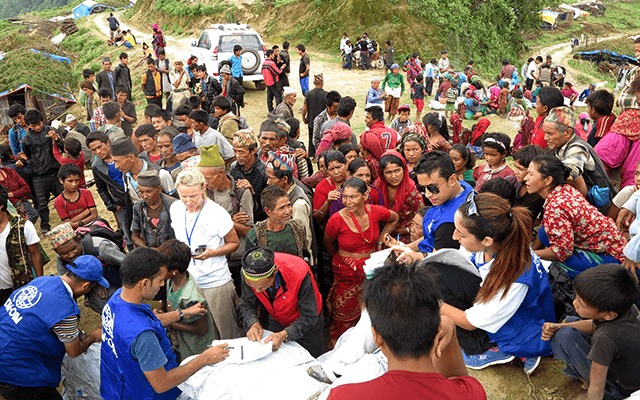 Here, IOM team is distributing plastic sheets and ropes in the Sindhupalchok district to approximately 200 households. Conduction of needs assessment and selection of beneficiaries are completed before the distribution starts. One beneficiary per household is asked to wait in line to facilitate the identification of people on-site. He/she has to sign and fingerprint on the distribution list after receipt of materials and also leave contact details if available. Photo by IOM Nepal. 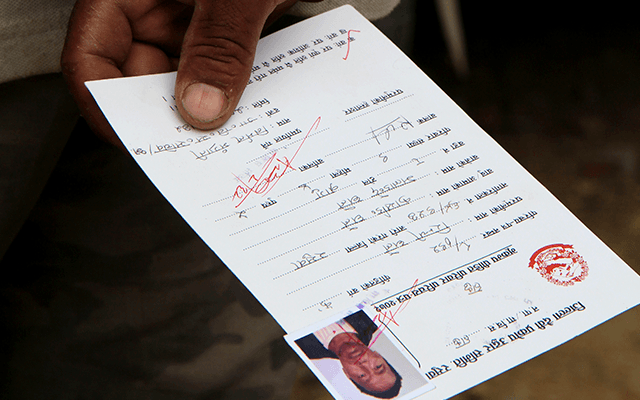 The government of Nepal distributed earthquake ID cards to each household to avoid duplication and to ensure that the affected population received the help they needed. These IDs are crosschecked for beneficiary selection and any other planned assistance. Photo by IOM Nepal. There are many groups within the affected population that are particularly vulnerable. Within IOM’s relief activities vulnerable groups receive special attention and support as they have specific needs, are at risk of abuse and exploitation, and might suffer from social exclusion. Particularly vulnerable groups are women who have lost their husbands during the earthquake and became heads of their household. These women become responsible for carrying the earthquake ID at distribution sites making them eligible for relief activities and material. Photo by IOM Nepal. 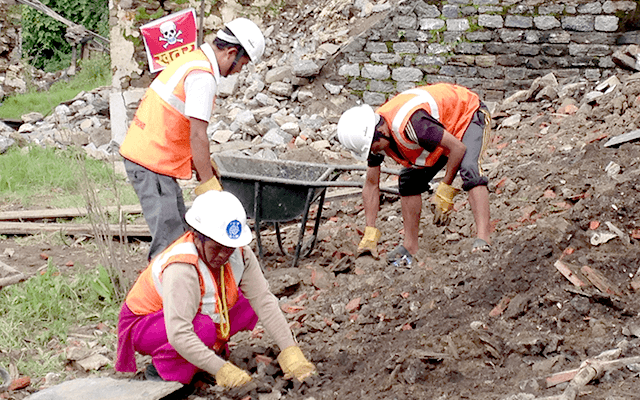 One of the tasks of the Shelter Pipeline Information Manager is consistent reporting, monitoring and evaluating of IOM’s Shelter activities in Nepal. This often involves monitoring visits to IOM’s implementing partners. (Above) On a monitoring visit to Nukawot district, beneficiaries received bamboo to build beds for their temporary shelters and also technical guidance in the form of community trainings. Photo by IOM Nepal. Winter approaching in Nepal brings with it its own set of unique problems. 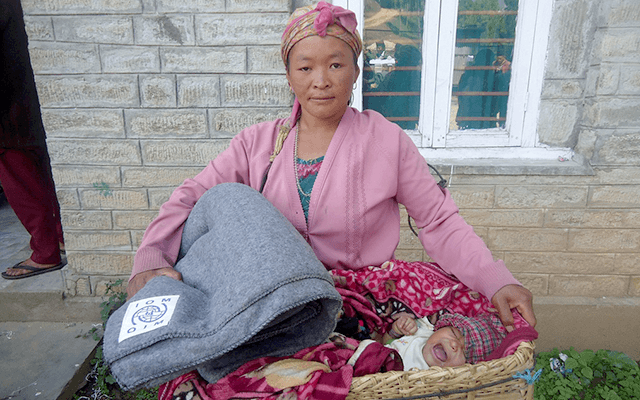 Earthquake affected families that are still living under plastic sheets or in camp settings are seeking to improve their living conditions to withstand the cold, especially in the mountains. 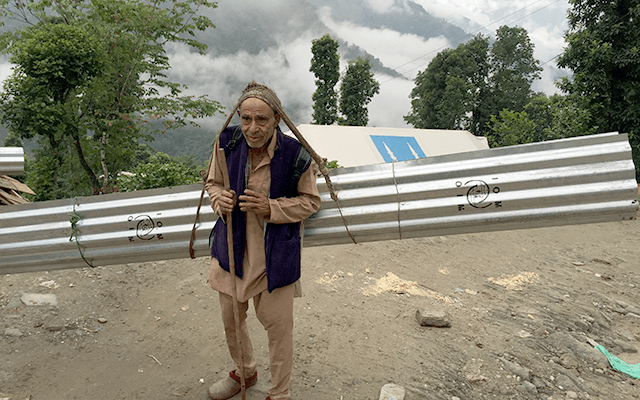 The man (above) was happy to have received corrugated galvanized iron sheets and was on his way home. Photo by IOM Nepal. 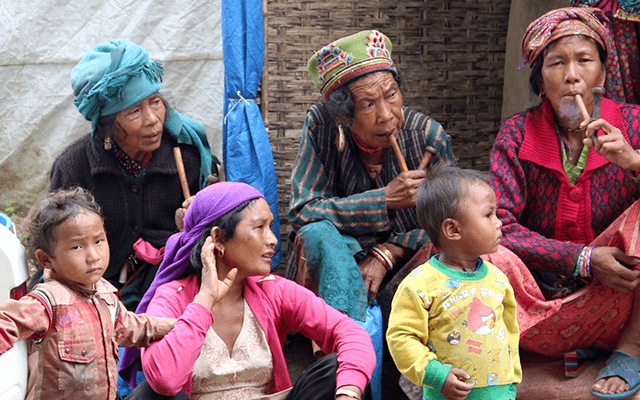 The emergency response phase in Nepal has shifted into early recovery. Looking at activities going forward, demolition of unstable and dangerous structures and debris management for cash have begun and provide a source of livelihood to the affected communities. Shelter Centers are currently being established in the most affected districts. They will serve as ‘one stop shops’ providing information and training on how to build back safer as well as supporting the coordination of reconstruction activities. Photo by IOM Nepal.